October….harvest time. The farmers have been busy, the gardeners can relax and lay up their treasures for the winter. The cows are happy, and Bernard’s happy! 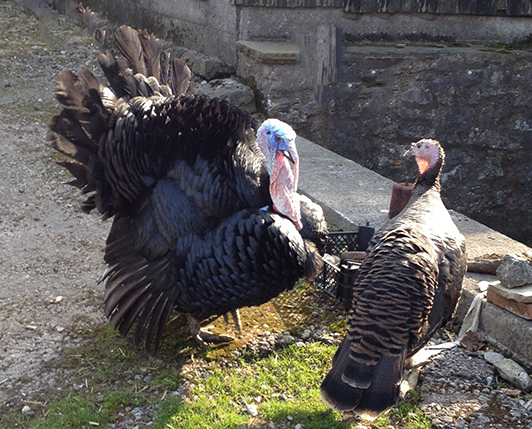 Bernard is the turkey at Top Farm and very proud of himself, particularly as he was originally to be Top Farm’s Christmas lunch last year, but no-one could bear to do the necessaries. 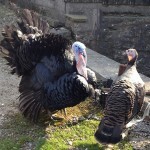 So now he struts round in all his finery, with his two turkey lady friends. They are very productive, and as such…Sheldon’s latest delicacy…turkey eggs. Now I’m very fond of poached eggs, and have been known to stretch to the occasional duck egg, but I’m still thinking that turkey poached eggs could just be a mouthful too far. Anyway Harold tells me they are delicious, and he knows about these things. Harvest festival is always very special in a farming community. Again this year it was a beautiful service in our church, conducted by our new Curate. The church was beautifully decorated with flowers and abundant produce and the pews gleamed. The loaf of bread and the grapes on the altar echoed those in the lovely stained-glass window behind, through which the sun shone. This year it was decided to give the produce offerings directly to a local charity, instead of the usual auction in the village pub. Congratulations to John. He is now half way through his fast track police training and came out with top marks in the halfway exams. The pressure continues as final exams loom. John will then be attached to Buxton Police Station and continue his training with a mentor. To celebrate Bonfire Night this year and say a big thank you to Sheldon Day helpers, we are having another bonfire and firework display on the playing field at 7.00pm (Saturday November 3rd) followed by a pea and pie supper in the Village Hall. All are welcome to the fireworks and bonfire, BUT we are limiting the meal to village residents, their families and those who helped this year on Sheldon Day. If you haven’t replied and can come, please contact Andrew Joly (07768 892865) or drop a note into Lindsey at Townend Cottage as soon as possible. We look forward to seeing everyone there! Big celebrations at the Dome in Buxton on Monday October 15th. Ken received his award from the County Council, nominated by me on behalf of the village, for the way he has helped make our village better over such a long time. Ralph Lord also received another award, nominated by Councillor Judith Twigg. Congratulations to both! Thank you to everyone for all your good wishes after my recent short stay in hospital. I escaped, commando style as Sheila put it, as quickly as I could, and am now resting at home. I was therefore unable to attend the Parish Meeting. However, Georgina chaired it in my place, and did so excellently with Sheila’s help and support. This entry was posted in Bonfire, Church, Congratulations, Derbyshire County Council, Jottings, Parish Meeting, Police, Sheldon Day by John Herbert. Bookmark the permalink.